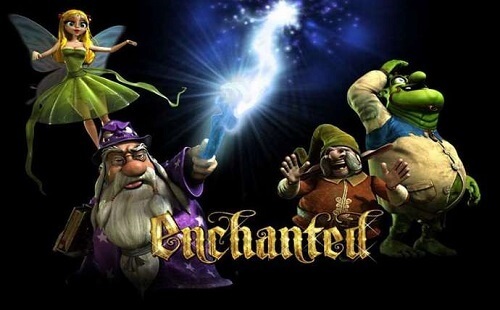 Enchanted is the newest magical pokie offered at Betsoft casinos in Australia. This pokie game features the signature Betsoft animation style in a forest setting. With 30 paylines across five reels, Aussies stand a chance to claim 5000 coins. Enchanted has a 92% payout percentage with plenty of free spins. This pokie has all the usual buttons, including the auto-spin, max bet and paylines options. So, it’s easy to stay on track with your budget. What’s more, this game is optimised for mobile. Enchanted features many symbols, which pay out depending on the value. At least three symbols must land on the paylines to win. Bonus symbols include Tonk’s Golden Keys, which will trigger the Tonk’s Tinkering Doors feature. This feature is active on the main game. In this pokie game from Betsoft, players can look forward to all the mystical fairy tale creatures. This includes elves, angels, wizards and ogres. In Enchanted, players will need to save a bird. Feera, the fairy, must rescue her bird from Rufus, the wizard. This is the ultimate bonus game on the pokie machine. Keep an eye out for the purple Crazy Hats, as two or more trigger the Crazy Hat’s Crazy Reels bonus game. This bonus game will earn AU players re-spins for bigger wins and more lucky combinations. To trigger free spins, players must land three or more Spell Book symbols. This will also activate the Ultimate Spell Book Free Spins bonus feature. In this mode, players should watch out for the Enchanted symbol on reel two to earn the full jackpot. All in all, we really liked the magical adventure that is Enchanted. The animations are spectacular, and there are plenty of extra features to keep players entertained. Of course, the sound effects are just as thrilling. For these reasons, we’ve rated this Betsoft pokie an enchanting four out of five stars.